Yesterday afternoon the Sacramento Transportation Authority (STA) passed an expenditure plan for a proposed countywide sales-tax increase but only after one of its board members threatened to oppose the measure should it appear on the November ballot. The threat was made by Sacramento City Council Member Steven Hansen, who fought to keep an air quality requirement in the ballot's language. Hansen's threat came after nearly three hours of public comment and deliberations that were contentious and exposed regional fissures on the STA board. The controversy erupted over the recent insertion of provision H in the proposed tax measure's implementation guide that would have required any funds allocated for new projects be in compliance with federally mandated air quality conformity guidelines in the Sacramento Area Council of Governments (SACOG) Metropolitan Transportation Improvement Plan. SACOG is a six-county agency authorized by federal and state law "as the Metropolitan Planning Organization (MPO) and is responsible for developing a regional transportation plan (MTP) in coordination with Sacramento, Yolo, Yuba, Sutter, El Dorado and Placer counties and the 22 cities within those counties (excluding the Tahoe Basin)." and Sacramento County Supervisor Phil Serna. Leading the charge to delete the language from the expenditure plan was Elk Grove City Council Member Pat Hume who said it was improper for SACOG to dictate how the transportation funds paid for by Sacramento County residents are used. At risk for Elk Grove could be funding for the Southeast Connector that the city views as a vital cog in its future development. "I continue to question the necessity of the provision that is contentious," Hume said. "We've heard from the business community that they are opposed to that particular measure." Referring to public testimony where several people urged the STA to provide greater funding for mass transit should the tax increase be approved, Hume said if the board went in that direction, the measure "would have zero chance of passing, it's great in ideology, but it doesn't work in reality." Inferring the 66-percent threshold needed to gain approval, Hume said the board was setting itself up for a ballot box failure. "I'm almost at the point of leaving this at the alter," he noted. During deliberations, Hansen, along with Sacramento County Supervisor Phil Serna stressed the need to keep the provision in the plan as a way of ensuring air quality obtainment measure are met, and federal funds are not lost. "I cannot see the harm in this," Serna said. "To me, it is actually a benefit, it is a better part of our narrative ultimately when we go out and ask voters to approve this." Hansen argued that the provisions inclusion would demonstrate to voters accountability of how the money would be allocated and noted polling showed voters are more likely to support the measure when strong fiscal controls are included. "It strengthens our margin of error to get approval," he said. 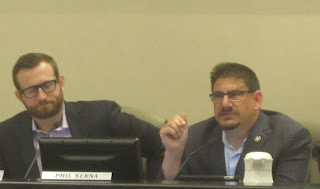 As the deliberations continued, the fissures on the STA board become more apparent with suburban elected officials like Hume, Elk Grove Mayor Gary Davis and Sacramento County Supervisor Don Nottoli, who wanted to strip the air quality provisions aligned against Hansen, Serna and Sacramento City Council Member Eric Guerra who fought for its maintenance. After nearly three hours of wrangling over deleting the provision, changing the wording, and motions and substitute motions, Hansen served an ultimatum if the provision was deleted. After discussing substitute language proposed the previous day written by STA Executive Director Jeffrey L. Spenser that some board members characterized as ambiguous, Hansen played his card. "If what goes forward is what Mr. Spenser has wrote, I will oppose it and I may actually campaign against it," he said. Sensing the gravity of the situation, STA Chair Kerri Howell called for a five-minute recess to craft substitute wording for the provision. When the board readjourned, they voted 13-1 to substitute the original wording of Provision H with language written by SACOG's General Counsel Kirk Trost. (see original language here on page page 11, H, and new language below). As part of the process of placing the measure on the November ballot, the proposal will be heard at city council meetings of Sacramento municipalities in May and June and come back to the Sacramento County Board of Supervisor and the STA for final approval. After the meeting, Hume said he felt the compromise reached "was the least alienating to both sides." "I think it could easily have been removed without any consequence to the overall plan," he said. "The margin of error for getting this approved is so razor thin, we just couldn't afford to have a provision that could be highlighted to be negative. What I don't understand is why the other side was so insistent it had to be there." New language for Provision H - Measure [to be named] expenditure plan funds programmed for a project construction phase shall not impair the ability of the Regions MTS and MTIP to meet Federal air quality conformity, as determined by the STA board.